As a vacation rental property manager, you know how important it is for people to be able to find your properties on the internet. That’s why a critical piece of the marketing process is finding out what search terms your customers use to find you. You can find the best keywords for vacation rental websites by starting with keyword research. For most of the industry, traditionally, that meant dealing with the big vacation house listing sites like Homeaway and VRBO—sites that whose business models, listing policies and rankings, and worst of all—fees—have constantly been in flux. And yet, until very recently, most vacation rental management companies relied solely on these sites to advertise their properties online. But the problem with relying solely on someone else to send you customers is that you don’t own the acquisition channel. You’re not playing ball on your own field. But then Mega Travel Corp comes to town and buys the stadium you’ve been playing in and all of their satellite ball fields. And suddenly, it’s not the old field manager who’s trying to make a living, it’s Mega Travel Corp’s shareholders who are thirsty for profits—double-digit growth, year over year. And who’s going to end up paying the cost for that double-digit growth? You and your customers, that’s who. “But what other options are there?” one of your teammates cries from the dugout. And therein lies the problem: because VRM (vacation rental management) companies are in the business of managing vacation rentals—not building websites—the whole industry jumped at the first service that did a good job of finding them customers via the internet. But the problem with relying on one or two channels, even those that have served you well for many years, is that it’s only one channel. And things, including that reliable channel, always change. This is why keyword research is so important. And sure, nobody’s suggesting that Google isn’t constantly tweaking and tinkering with their algorithm, but for the most part, they’ve stayed pretty consistent in trying to serve up the best answers to any keyword query. That’s why covering all the appropriate keyword queries for your location is crucial. The first step to ensuring your VRM website is well-targeted with quality keywords is building out a core keyword set focused on your location. By focusing on your [location] + “vacation rentals” (and every variation of that location) you can target your website’s content to be most findable for Google’s search spiders who crawl your site—and for customers trying to find your rental. Below, we’ve outlined twelve ways to ensure you’ve got the right keyword coverage for your VRM site. Building out a well-rounded set of keywords is a cinch with Google Suggest: enter a search query into the search field but don’t hit enter. You’ll see a drop down populate with suggested searches. Add a space after your query, and then type in a letter. Record the suggestions in a spreadsheet. At the bottom of each search results page, there is a list of related search terms. Copy and paste them into your spreadsheet for some Google-approved related keyword terms. Pro Tip: Install Keywords Everywhere to get a listing of search volume (the number of searches per month on average) next to the related searches (pictured below). Look at the search engine results page (SERP) for terms for which you wish to rank. What terms are your competitors using in their title tags, their descriptions, their URLs, and their page content? These are all good indicators of what keywords your competitors are trying to target. Add those terms to your list and repeat number 1 above to get variations. You should always consider other ways that your customers search for your products or services since that's the whole point of keyword research. This is especially true if you're in a competitive market. Try using alternative terms for properties: “vacation homes,” “villas,” “beach houses,” “beach rentals,” “condos,” “luxury homes,” et cetera. Try getting more specific with your keywords. Are you dead center in San Diego or are you near the Gaslamp Quarter? Try modifying your keywords to target specific neighborhoods—the ones your property is in and the ones it’s near—and let the big dogs like HomeAway and FlipKey fight over “San Diego.” These hyperlocal terms tend to convert better anyway. Building your keyword list doesn’t have to be like squeezing water from a stone. Try one of the tools of the trade. Running a paid search campaign? Pull top converting keywords from Adwords reports, and then find variations using tip number 1 above. This way you'll know what keywords are already driving the most revenue, clicks, and interest in your listings. Testing these keywords out on your organic listings is a great way to make good use of this data. Add in-demand amenities or features that people are looking for in a rental property to the end of your core search phrases. Review the site structure of the big VRM sites. Look at their navigation to see how they are categorizing their content. Take note of their filters. These are all clues that you can use in filling out your keyword set. Modify your original search, creating differing orders and variations like [vacation rentals] [location]. If your locale is multiple words, try different abbreviations or even try rearranging the query. Google Trends can be used to compare the relative demand from different searches to see which variations are more popular and which are growing (optimizing for a less-popular but growing trend might be a good strategy to try). In addition to showing you variations of your core keyword, it can also show you some trending regional keywords that you may want to consider. Use Google Search Console to look at keywords your site is already ranking for and use that information to come up with new ideas. If you don't have this set up, we can help you do that. It's very easy. Once you’ve got a nice big juicy list of keywords, it’s time to start filtering some out, and to do that, you’ll need to think about the language customers use to search, the likely intent of different keyword variations, and different key phrase order. For the past several years Google has been improving their semantic search processing to improve the results they show to users. One of the most recent additions was the announcement of RankBrain. RankBrain utilizes a form of machine learning to help Google understand the intent behind the queries used by visitors to Google’s search engine. Most of the time Google will assume the same intent based on the query (regardless of keyword order) and return the same results. But sometimes there may be minor differences in the search results that you can leverage. The first result implies the searcher might be looking for news on vacation rentals in San Diego. Notice how Google lists the “News” tab directly after “All”. If you haven’t heard, San Diego has been in the news a lot recently due to new city regulations for vacation rentals. 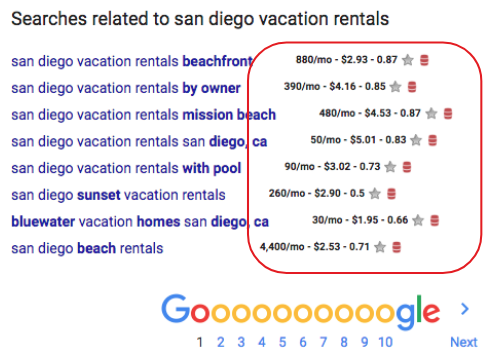 In the second, the results are largely the same but the “Maps” link is listed first suggesting Google might think this searcher is looking for someplace nice to rent in San Diego. This isn’t the only thing to look for when trying to ascertain how RankBrain has interpreted search intent but it’s certainly something to which you should pay attention. An easy way to understand the perceived search intent of a keyword is to use Google search itself. All of these are clues that can indicate the kind of search intent for each keyword. Understanding the search intent behind the keywords you’re targeting can be the difference between capturing traffic that converts into bookings and traffic that is low quality and doesn’t book at all. Having a large list of keywords that don’t convert won’t be very helpful for your business, so take some time to vet the keywords and key phrases you’ve generated through the steps above through the lens of search intent to get your keyword list dialed in. Now you’ve generated a really solid set of keywords upon which to focus your optimization efforts, what’s your next move? Watch this space for the next post in this series where I’ll go into more details on how to use all this great keyword research you’ve done in a later post. Have any tips of your own? Found anything here especially helpful, or found things that have worked better? Let us know on our Facebook page, or join the discussion on our company LinkedIn.